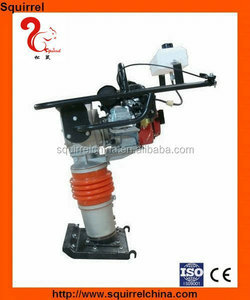 Chengdu Gute Machinery Works Co., Ltd.
Yanggu Dongrun Construction Machinery Co., Ltd.
Honda engine mikasa soil tamping rammer with top quality (FYCH-80) Gasoline Tamping Rammer Machine is used for tamping of engineering foundation and groove backfill in the field of road, public project, telecom, gas, water delivery, railway and so on. 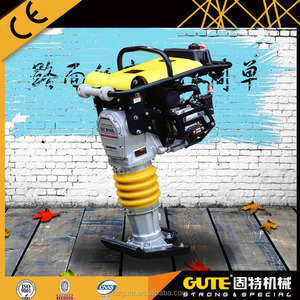 Tamping Rammer 2.High strength spring ,large amplitude jump and strong pounding power. 3.High strength base plate design, the hardiness and softness is moderate, which is durable. 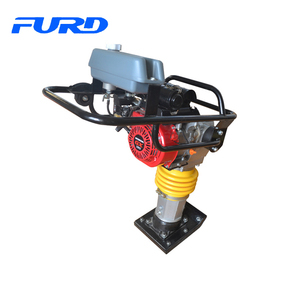 , Ltd is specialized in the sales and production of small road roller, compact ram, mobile lighting car, hydraulic power station, troweling machine and other construction machine. Our products are widely used in municipal and highway pavement road roller maintenance, small area compacting and depressed trough and so on. Our equipment is favored by many construction companies and have a large market in China. 4.the equipment can complate all kinds of compacting works. Q:What's the delivery time9 A: Shipped in 7 days after payment. Q:What's the packing9 A: Iron pallet/plywood case. 2.An heavy duty throttle control provides more reliable and longer service. 4.An integrated fuel valve provides for easy starting. Accepts more compacting force, offers a reliable lubricating system. Ningbo Max Machinery Co., Ltd. 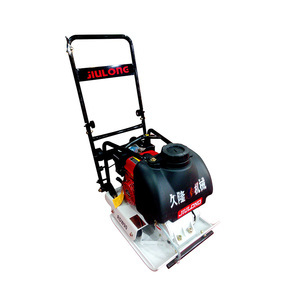 Widely used in road, railway station, bridge, reservoir dyke, the wall and the land of narrow ditch construction. 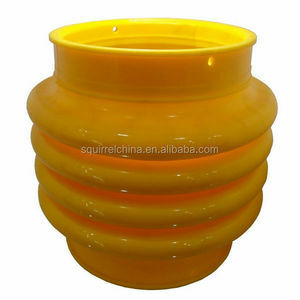 Minrui market mainly include: middle east, africa, south africa, india, east asia, latin america. Hope to establish long time and stable relationship with world distributor and end user. Wuxi Success Technology Co., Ltd. 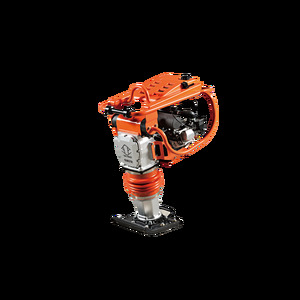 Powerful Tamping Rammer MIKASA STYLE, POWERED BY HONDA GX160 5.5HP, 14KN ABOUT US: PLEASE FEEL FREE TO CONTACT US FOR OUR BEST PRICE AND DELIVERY TIME. THANKS! Changge City Noah Mechanical Equipment Co., Ltd. The double spring derive can effectively buffer the force transmitted to the operating handle and mainly parts. 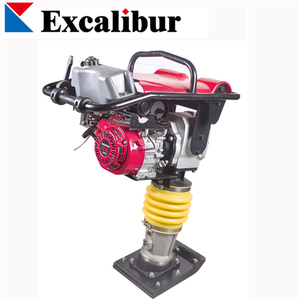 Internal combustion type rammer and manual throttle controller is easy to operate. 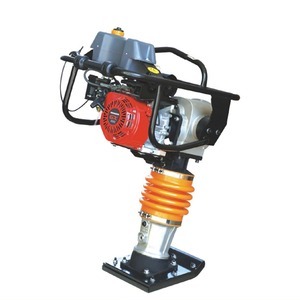 3.Rammer shoe made of steel plate with wooden insert offers economical usage. Henan Aido Machinery Co., Ltd.
2, Do you have stock production to sell9 Yes, of course, but we also offer OEM service, Pls send us some drawing. 3, What information do you want to know if I want to get a quotation a) The model/size of your products. c) Specially package d) Raw material 4, What is your advantage9 a) We are factory in construction machine for 20 years. Construction Machinery Ground Mikasa Price Tamping Rammer For Sale Philippines Quick Read: 1. Two types: Electrical and Gasoline 2. 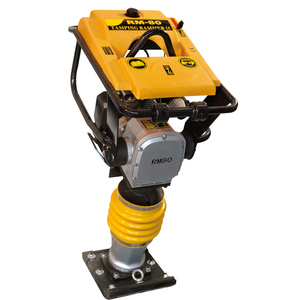 Heavy shock mount system to reduce hand-arm vibration and improve comport 3. Low gravity design makes more stable operation 4. 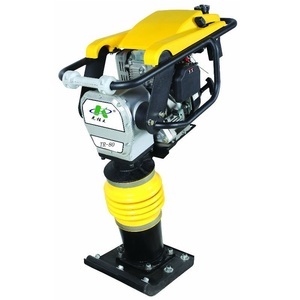 Rammer shoe made of steel plate with wooden insert offers economical usage 5. Flexible,easy,safe and reliable operation Application: Adapted to the construction of buildings, ground, embankment, bridge piles, trenches, field, narrow space and water conservancy project, capable of medium-sized machinery can not complete the task. Technical Parameters Model HC80 HC90 HC100 HC110 Power 2.2KW 3 KW 3 KW 3 KW Take off height 40-60 mm 45-70 mm 45-70mm 45-70mm Impact energy 5.6N.m 6.5 N.m 6.5 N.m 6.5 N. m Advance speed 10-13m/min 10-13m/min 10-13m/min 10-13m/min Impact frequency 460-650 times/min 460-650 times/min 460-650 times/min 460-650 times/min Plate size 300X280mm 300X280mm 300X280mm 300X280mm Weight 70kg 80kg 85kg 100kg Gasoline plate compactor Electric plate compactor Tamping rammer Packaging & Shipping We will protect machines well by its package----wooden boxes. Diesel engine is optional. 7,Steel plate with wooden inserted offers economical usage and perfectly balance. 8,Optional wheel kit for easy transpor tation .